Awhile back, a conversation at Ashlawn Coffee in Old Saybrook brought up the word “blight,” in connection with a new committee in Old Lyme. Is one person’s “ugly condition” possibly a delight for someone else? That brought up the word “Blighty,” a word referring to England, possibly from Urdu and no connection whatsoever with the word “blight.” So do some words we use infrequently mean the same to all of us? 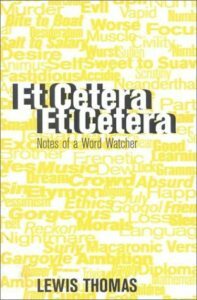 That question, nagging my brain, led me back to a book I had read almost 30 years ago, Lewis Thomas’s Et Cetera, Et Cetera, in which this medical doctor explores the derivation of many of our common words, with great humor and erudition.. Consider: animus, pessimism, snare, sleep, fastidious, scrutiny, pupil, hair, googol (not Google, I might add! ), free, music, ethics, and Gaia. From their origins in Indo-European, Greek, Latin, and other languages, to today’s usages, these words have evolved almost as much as we homo Sapiens. Take, for example, the word “presently.” Some 300 years ago, it was used by the English to mean now or at this moment. Then, in the 18th and 19th centuries in “Old Blighty,” English novelists used it in the sense of the near future. That persisted into the 20th century, but in the last 50 years “presently” seems to have begun to revert to its original sense in many vocabularies. Can we as human beings actually learn to live together? Step back a moment and explore words with Dr. Lewis Thomas, and then go forth and share them with everyone else. Editor’s Note: ‘Et Cetera, Et Cetera’ was written by Lewis Thomas and published by Little, Brown & Co., Boston 1990. About the Author: Felix Kloman is a sailor, rower, husband, father, grandfather, retired management consultant and, above all, a curious reader and writer. He’s explored how we as human beings and organizations respond to ever-present uncertainty in two books, ‘Mumpsimus Revisited’ (2005) and ‘The Fantods of Risk’ (2008). 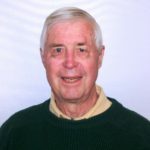 A 20-year resident of Lyme, he now writes book reviews, mostly of non-fiction that explores our minds, our behavior, our politics and our history. But he does throw in a novel here and there. For more than 50 years, he’s put together the 17 syllables that comprise haiku, the traditional Japanese poetry, and now serves as the self-appointed “poet laureate” of Ashlawn Farm Coffee, where he may be seen on Friday mornings. His wife, Ann, is also a writer, but of mystery novels, all of which begin in a village in midcoast Maine, strangely reminiscent of the town she and her husband visit every summer.